Route 380 started life at the end of 1990, running between Abbey Wood and Lewisham via a number of residential areas close to the 180 route, from which it took its number. The route commenced from Abbey Wood Station, on Harrow Manor Way, and ran via current route 469 via Abbey Estate and Plumstead to Woolwich, then via Wellington Road, Frances Street, Woolwich Dockyard Station, Thorntree Road, Charlton Village, Blackheath Royal Standard, Prince Charles Road, Long Pond Road, Duke Humphrey Road, Hare and Billet Road, Wat Tyler Road and Lewisham Hill to Lewisham. During the day buses terminated in Molesworth Street, at the back of Lewisham Centre, but in early mornings and evenings they terminated and stood at Lewisham Bus Station. 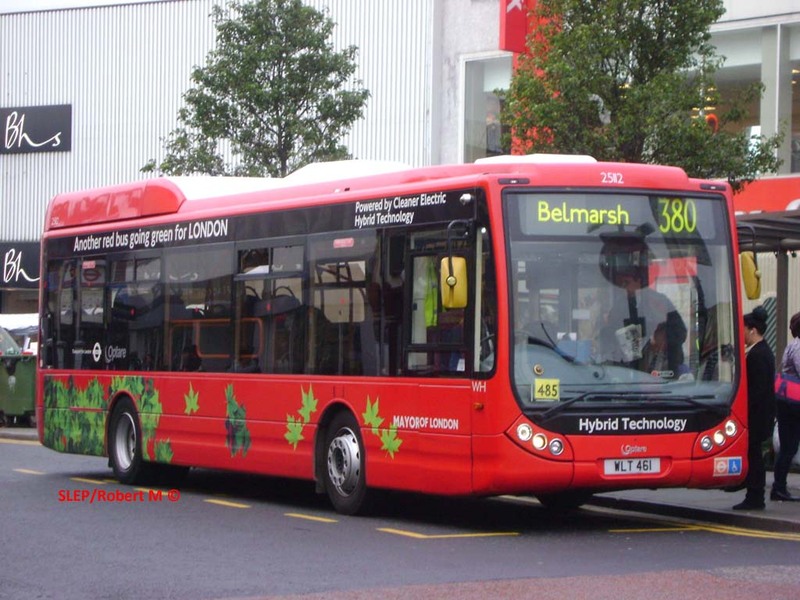 Buses ran every 15 minutes during the day and half hourly in the evenings, with no Sunday service, using 8 new Metroriders from Plumstead garage, the first production batch built by Optare (as opposed to MCW). Since then there have been many changes to the route. First in May 1993 came a diversion via Charlton Church Lane, Priolo Road (return Wellington Gardens) and Eastcombe Avenue, and at the other end via Alsike Road. Buses terminated at the east end of the latter, and thus no longer served Abbey Wood station directly. The daytime frequency was also upped to every 12 minutes, the vehicle requirement rising to 11. In 1995 the routeing at Abbey Wood was altered again, with the terminus reverting to Harrow Manor Way, but buses reaching there via Yarnton Way and Alsike Road rather than directly – also reversing the direction in which Alsike Road was served! 1996 saw more major changes. The service was withdrawn between Abbey Wood and Woolwich (apart from garage journeys from and to Plumstead garage), this section being replaced by route 177. Although the 380 was a relatively lengthy route, this actually made the 177 longer than the 380 had been, running all the way to Peckham. The change was said to have been to increase capacity in the Abbey Estate area, as the 177 used 9.8m Darts which would not have fitted around roads in the Charlton area, but as the capacity has since been reduced again (the 177 being replaced by the 469 in Abbey Estate and B11 in Alsike Road) this does not appear to have been needed. At the same time, a Sunday service was introduced. In 1998 the Lewisham terminus was standardised to Molesworth Street at all times. The new contract also saw the elderly minibuses used swept aside by brand new Mercedes Varios, although these proved somewhat troublesome. The next change occurred at the end of 1999, and was in reaction to Greenwich Council's plan to return some of the roads on Blackheath to natural heath, with Long Pond Road and part of Duke Humphrey Road being stopped up. As a result the 380 had to be re-routed; the odd routeing across the heath was purely to avoid the many traffic restrictions in the area. 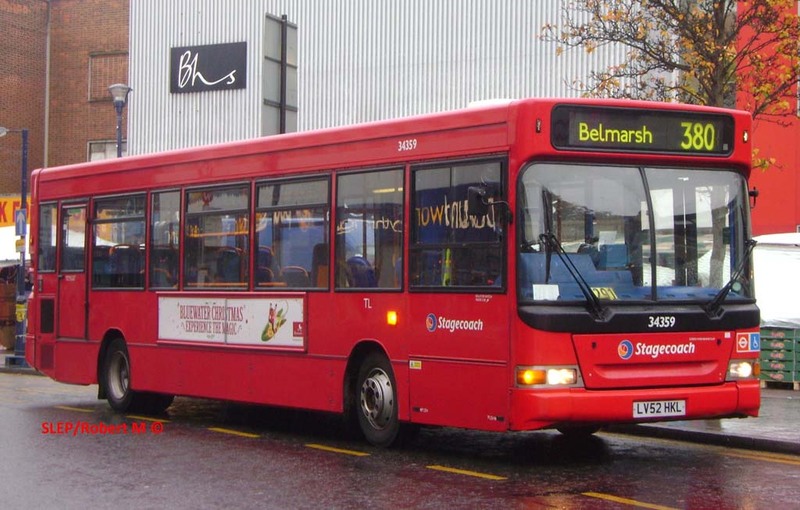 The best option was to divert the route via Tranquil Vale, as this would allow the route to stop closer to Blackheath village, and to facilitate this the width barrier in Tranquil Vale was altered with a bus gate in the middle. Other non-car traffic wishing to pass between the two sides of this barrier now has to take a 2-mile detour via either Belmont Hill or Blackheath Hill! Garage journeys between Plumstead garage and Woolwich were withdrawn when a new contract commenced in January 2003, which also specified new low floor Darts. 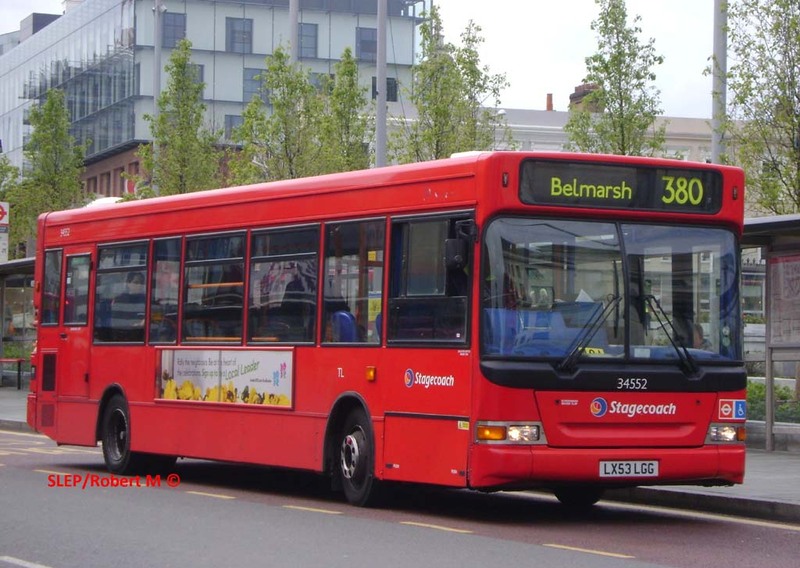 The last major change occurred later in 2003, when the route was extended from Woolwich to Belmarsh Prison via Broadwaters and Thamesmead West. Although this merely duplicated route 244, the change was needed to provide extra capacity to this rapidly growing area. Indeed, as more roads were built and opened, the opportunity was taken in February 2006 to divert the 380 via Hillview Drive and Battery Road, giving it a new unique section! 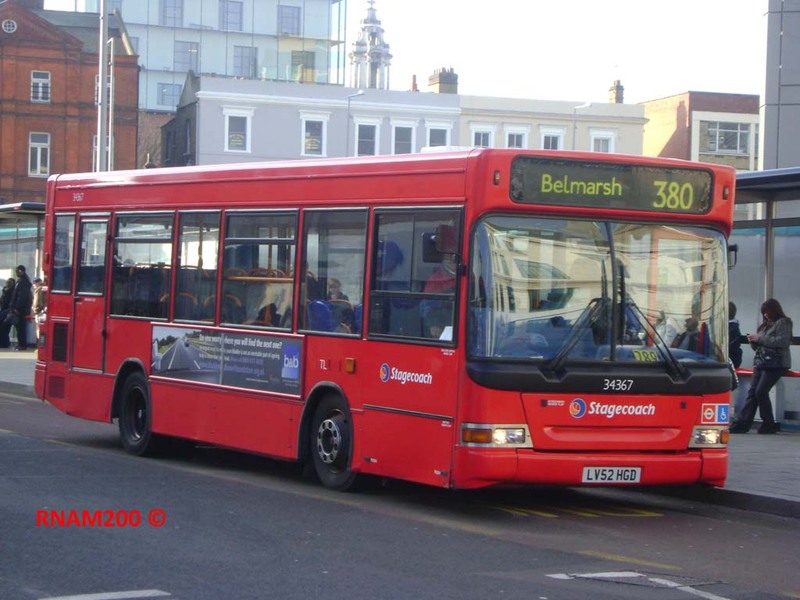 A couple of Alexander ALX200 bodied Darts, which had been hanging around at Bromley without a proper home ever since route 273 was lost to First in January 2002, were drafted in to cover this change. Operation was transferred from Plumstead to Catford garage on 4 November 2006. For some time, a number of routes in the Catford area, such as the 54 and 202, were operated from Plumstead as Catford was full, but Selkent has been losing a lot of routes in the south of its territory in recent years, and the situation has now reversed, with several Woolwich area routes operated from Catford. The evening and Sunday service, which had already been improved to every 20 minutes, was further increased to every 15 minutes from October 2007 – but the Monday to Saturday daytime service remains stuck at every 12 minutes! Short Darts had been used owing to some tight corners in the Charlton area. However, a surprise move during 2011 was the introduction of larger buses which were becoming available off other routes. The majority of these are 10.2m Dart SLF/Pointers. Catford garage, which now operates the 380, already had some of these allocated to routes 178 and P4. One of those meant for the 178 is 34552 (LX53 LGG), seen in Woolwich on 24 April 2012, before the arrival of the route's own buses of this type. At one time both the 178 and 380 were allocated to Plumstead garage, and I am told these buses did appear on the route then as well. To make up the allocation, some similar vehicles were transferred in from Bromley garage where they had been allocated to route 314, which got new buses. 34359 (LV52 HKL) is around a year older and was seen in Lewisham High Street on 24 November 2012. Note that bolder font for the fleet numbers, preferred by Bromley garage. I believe a few short Darts linger on - one is needed for the "temporary" diversion of route 273 via St. Mary Cray, anyway. 34367 (LV52HGD) was in Woolwich again on 19 January 2011. What actually prompted the switch to bigger buses was the decision to allocate Stagecoach London's five Optare Tempo hybrid buses to the 380. These had previously been allocated to route 276, which was lost to Docklands Buses on September 2011. There have long been environmental concerns in the Blackheath area, which may have something to do with the decision. Although these were the first regular long buses on the route, I have left this entry to last as they make up a minority of the allocation. 25112, carrying Routemaster registration WLT 461, picks up in Lewisham once again, on 13 October 2011.